Andrew Bogard as Major Domo in “Vanessa” at the Santa Fe Opera. SANTA FE — There was perhaps no grander opera moment at last summer’s festival season here than the overture to “Don Giovanni,” Wolfgang Amadeus Mozart’s monumental tale of lust, deception, and divine retribution. As conductor, John Nelson led the orchestra through the composer’s powerful opening movement, the Santa Fe Opera’s outdoor Crosby Theatre offered commanding views of the Jemez and Sangre de Cristo mountains, chains of spiky peaks that flank the theater and offer spectacular sunsets. But there would be scant light this summer evening. A thunderstorm raged in the distance, darkening the sky as an enormous bust rose from below the stage. Deadly yet graceful, the bronze figure seemed to emerge directly from the thunderheads, which traded bolts of lightning in time to the music. That was certainly the case last August, when I arrived at this high desert city for a crash course in the operatic arts. The Santa Fe Opera was in the midst of its 60th anniversary season — a milestone for any arts organization, but one made all the more auspicious after successful fund-raising efforts have enabled the SFO to greatly expand its facilities. To celebrate, the company mounted three 20th century works — Giacomo Puccini’s “La Fanciulla del West,” Richard Strauss’s “Capriccio,” and Samuel Barber’s ravishing “Vanessa.” Add to that a pair of classics — Charles Gounod’s “Roméo et Juliette,” and the aforementioned “Don Giovanni” — and you have the sort of varied season that the company’s founder, John Crosby, envisioned when he started the company back in the 1950s. Igor Stravinsky was an early champion of the unlikely company, which produced many of the Russian composer’s vocal works during its first decade. Crosby had a similar affinity for Richard Strauss, and over the years the Santa Fe company has mounted almost every opera — including a host of American premieres — by the German composer. Meanwhile, the opera’s festival format meant aficionados could get a heavy infusion of opera in the evening, leaving them free during the day to explore the ancient and modern cultures of Santa Fe. Many of those elements survive today, including nearby Indian pueblos, the Santa Fe Plaza with its Native American vendors, and the breathtaking Bandelier National Monument. The nearby Santuario de Chimayo, an 1816 church that’s sometimes called the “Lourdes of America” because of the purportedly curative powers of the dirt beneath it, remains positively otherworldly — its walls lined with crutches and pictures of the infirm. Along those lines, the Loretto Chapel, with its so-called “Miraculous Staircase ”; the Cathedral Basilica of Saint Francis of Assisi; and the San Miguel Chapel — believed to be the oldest church in the United States — are well worth a visit. When it comes to the arts, however, Santa Fe is most closely associated with Georgia O’Keeffe, the modernist painter who called New Mexico home for much of her life. O’Keeffe’s indelible vision of the American southwest has been definitive for subsequent generations of artists and aesthetes who’ve taken up residence in this city of timeless vistas and golden light. Her influence remains palpable today, from the city’s Georgia O’Keeffe Museum, which houses more than 3,000 objects, to Canyon Road, a winding, gallery-lined art trail that offers an uneven display of works — some kitschy, some well-executed — in equal measure. More recently, a very different vision of the city’s arts scene has emerged with the arrival of the Meow Wolf Art Complex, a 33,000 square-foot art environment made possible by George R.R. Martin of “Game of Thrones” fame. The interactive art complex, which inhabits a repurposed bowling alley, features the work of more than 130 artists in it first permanent exhibition: the “House of Eternal Return,” a reality-bending installation where visitors explore an everyday family home that gives way to a phantasmagoria of alternative artistic realities. Think “Stranger Things,” but whimsical. 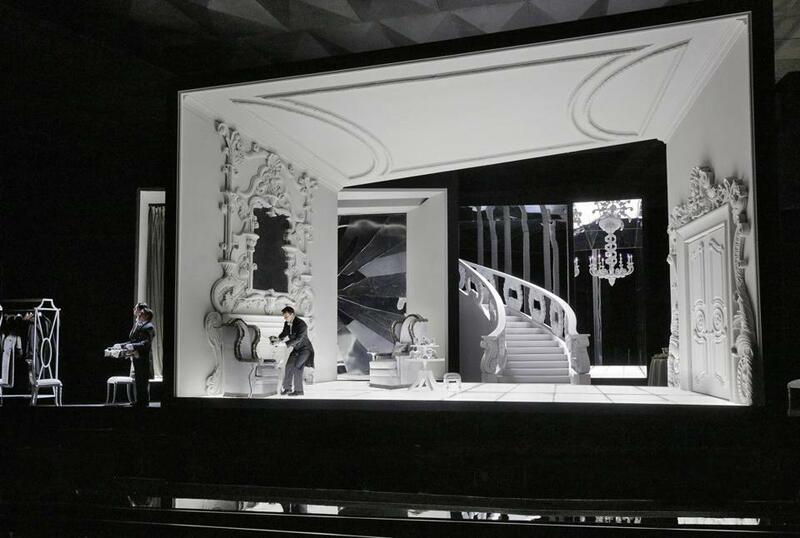 Seven miles north of the city, the Santa Fe Opera has continued to evolve as well, producing some 14 world premieres and roughly 45 American premieres over the last six decades – an artistic priority that Crosby signaled from the company’s inception. The company continues to commission new works, including next season’s world premiere of Mason Bates’s “The (R)evolution of Steve Jobs,” a genre-blending work that mixes traditional instruments with electronica. “That’s pushing the envelope for us,” said MacKay, who added that he tries to balance newer works against more traditional repertory. But the SFO has evolved in other ways as well. The company completely renovated the Crosby Theatre in the late 1990s, expanding it to more than 2,100 seats and covering the entire structure with a curving roof – a wave-like form meant to enhance the outdoor venue’s acoustics. And while the theater still sits on its original hilltop perch, it now presides over a 165-acre campus that includes practice halls, artist rehearsal studios, al fresco dining areas, and a swimming pool for staff. Many of those new and refurbished facilities are thanks to a fund raising campaign that concluded in 2011. The company has since embarked on an even more ambitious effort, seeking to raise $45 million for additional capital improvements and to further bolster its endowment. The SFO has already secured $41.5 million toward that goal, which over the past two years the company has used to double the size of its backstage facilities, while also expanding its public amenities such as restrooms, box office, and bar and lounge areas. “I really see it as getting our house in order,” said MacKay.